The name "Alaska" is derived from the Aleut word "Alyeska," meaning	"great land." "North to the Future" - Our motto was chosen in 1967 during the Alaska Purchase Centennial and was created by Juneau newsman Richard Peter. The motto is meant to represent Alaska as a land of promise. Click to view the Alaska State Constitution on the Lieutenant Governor's website. Juneau, located in the southeast region of Alaska, has a population of 33,277 (2015 Estimate of Population, Alaska Department of Labor and Workforce Development). The Juneau Convention and Visitors Bureau. Please note that this is a visitor-oriented link, not a research site. Visit http://www.juneau.com/ to get the flavor of the city. Seward's Day commemorates the signing of the treaty by which the United States bought Alaska from Russia, signed on March 30, 1867. Alaska Day is the anniversary of the formal transfer of the territory and the raising of the US. flag at Sitka on October 18, 1867. 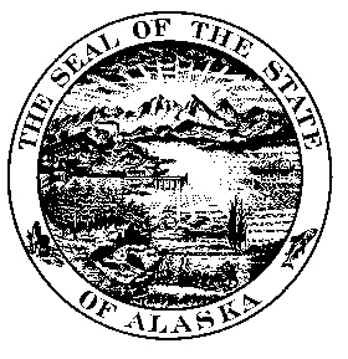 The state seal was originally designed in 1910 while Alaska was a territory and not a state. The rays above the mountains represent the Northern Lights. The smelter symbolizes mining. The train stands for Alaskas railroads, and ships denote transportation by sea. The trees symbolize Alaskas wealth of forests, and the farmer, his horse, and the three shocks of wheat represent Alaskan agriculture. The fish and the seals signify the importance of fishing and wildlife to Alaskas economy. 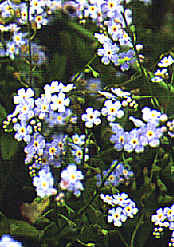 The blue field is for the sky and the forget-me-not, the state flower. 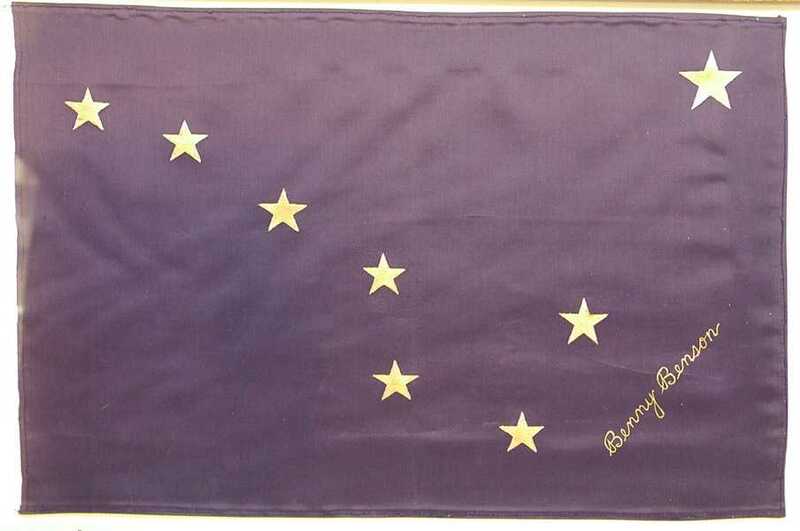 The North Star is for the future of the state of Alaska, the most northerly of the Union. The dipper is for the Great Bear, symbolizing strength. See larger view of flag. See information about the Alaska State Song "Alaska's Flag". Alaskas state gem is jade. Alaska has large deposits of the gem, including an entire mountain of jade on the Seward Peninsula. The tall, stately Sitka spruce is the state tree. 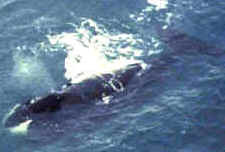 It is found in southeastern and central Alaska. 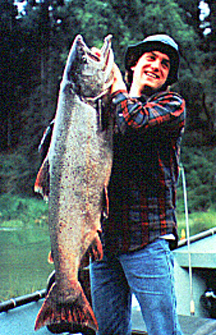 The giant king salmon, which can weigh up to 100 pounds, is the state fish. Gold is the state mineral. 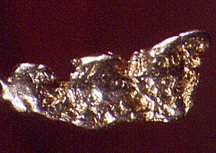 Gold has played a major role in Alaskas history. Secretary of State William H. Seward arranged for the United States to purchase Alaska from Russia in 1867 for 7.2 million dollars, or 2 cents per acre. Check out this link from the National Archives, it shows the actual cancelled check for the purchase! 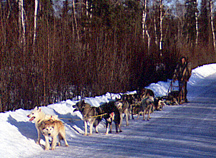 Dog mushing is the state sport. It was once a primary form of transportation in many areas of Alaska. 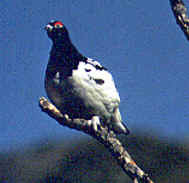 The pheasant-like willow ptarmigan is the state bird. This bird changes color from light brown in summer to snow white in winter. 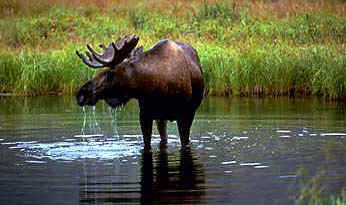 The moose was made the official Alaska land mammal when Governor Tony Knowles signed SB 265 into law on May 1, 1998. Moose can be found from the Unuk River in Southeast to the Arctic Slope, but are most abundant in second-growth birch forests, on timberline plateaus and along major rivers of Southcentral and Interior. They are not found on islands in Prince William Sound or the Bering *Sea, on most major islands in Southeast, on Kodiak, or the Aleutians groups. 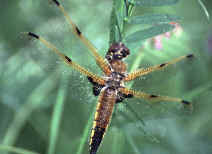 The four spot skimmer dragonfly, per legislation (HB 239) introduced by Senator Georgianna Lincoln on behalf of elementary students in her district, and passed by the 19th Legislature in 1995 (Ch 49 SLA 95).